Shintō is the traditional spiritual practice of Japan. Much of what we see today comes from prehistoric times, but Shintō permeates society in one of the most modern countries in the world. The idea of divine ancestry of the Emperor comes from Shintō. The earliest Japanese documents record what was believed in the early 8th century CE about the origins of the universe, which at the time meant just the Japanese archipelago. Buddhism arrived from China via Korea in 552 CE. Buddhism is responsible for the various scripts in which the Japanese language is written. Shintō has been associated with the Emperor, while the feudal military governments of the Shōguns were at least nominally Buddhist. Shifts in power from the Emperor to the Shōgunate and back again correspond to shifts in influence and thus power between Shintō and Buddhism. Surveys about belief and practice yield confusing results. The word shūkyō or "religion" didn't exist in Japan until the 19th century. Over half the people in Japan say that they aren't associated with any religion. But at the same time, well over half report religious activity. Tōshō-gū, a Shintō shrine at Nikkō. Sensō-ji, a Buddhist temple in the Asakusa district of Tōkyō. Most Japanese people do Shintō things, but they don't say that they are Shintō. "I am Shintō" would imply "I formally belong to this specific Shintō organization", so almost everyone answers "No". However, wedding ceremonies frequently are performed by a Shintō priest. Construction projects and automobile purchases frequently involve Shintō purification rites. Less than half the population of Japan identifies with an organized religion, but well over half of Japanese households have a Butsudan or Buddhist altar in their home. Funerals and burials tend to be Buddhist. Few people in today's Japan know much about either Shintō or Buddhism beyond the basics. They do some things from one, or the other, and most likely a mixture, without much understanding. Meanwhile there's also a big business in wedding rituals with a quasi-Christian appearance like something out of a Godfather movie. So, the topic of religion in Japan is confusing. 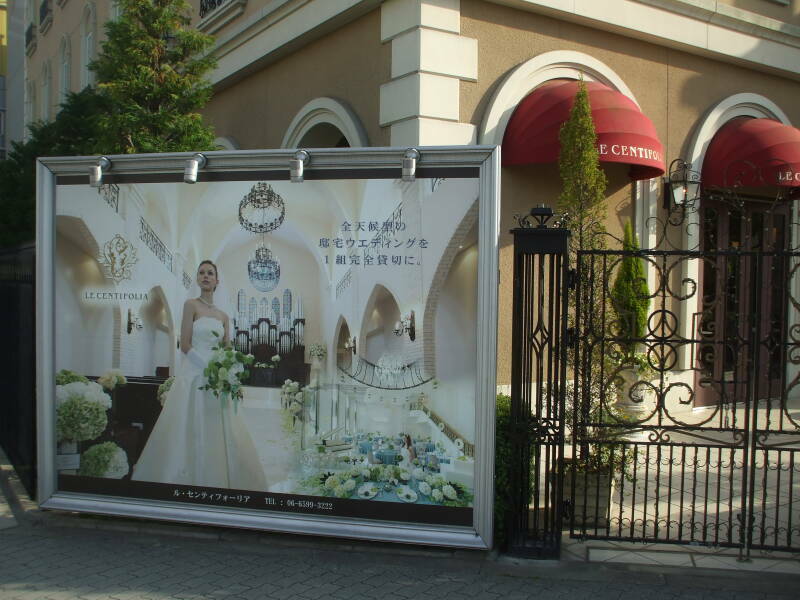 La Centifolia, a Godfather-style wedding facility at the harbor in Osaka. 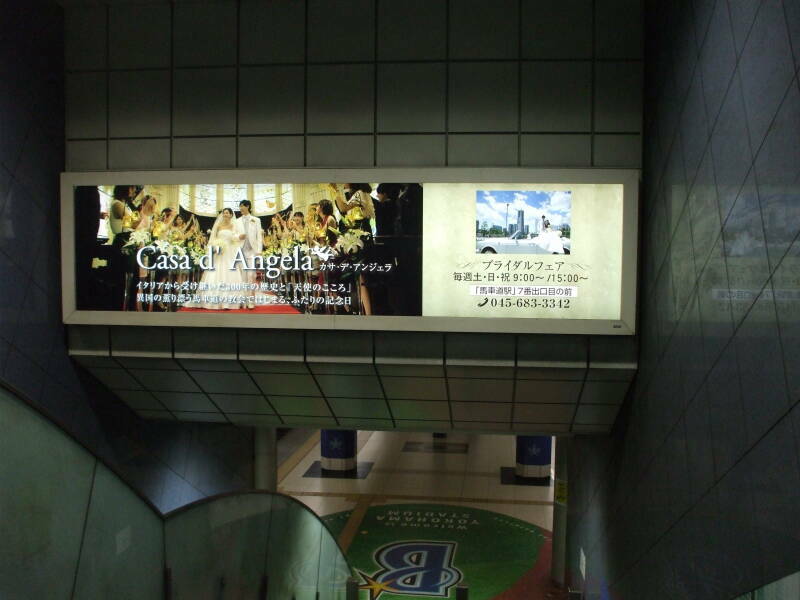 An ad for Casa d'Angela in the Yokohama subway. It seems to me that Buddhism and Christianity are very compatible. You can't really practice one without fulfilling most of the requirements of the other. I saw the Dalai Lama present a commentary on Geshe Langri Tanpa's Eight Verses on Training the Mind in New York in 1999. He pointed out the many parallels to the Sermon on the Mount. At the end he led a Buddhist prayer, explaining that it was nearly identical to one written by Saint Francis of Assisi. As for Shintō, it's just a very different thing. That much is easy to say. Going deeper gets complicated. A Buddhist place of worship is a temple. Buddhist temple names usually end with -ji or -tera or -dera or -dō or -in. There will probably be an image or statue of the Buddha, or a Bodhisattva or other enlightened being. Monks and nuns will dress in shades of saffron to dark brown. 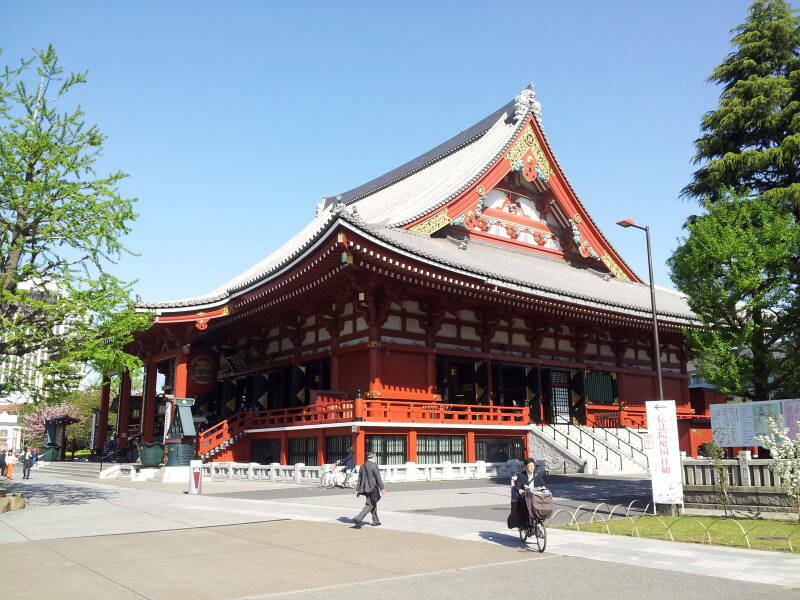 A temple is a building where services can be held. A Buddhist shrine is a miniature structure, maybe no more than a meter on a side, containing an image or statue. A Shintō place of worship is a shrine. Shrine names usually end with -jinja or -jingū or -gū or -taisha. There may be guardian statues, frequently foxes, but no image of the enshrined kami or spirit. A rope hangs down from a bell or rattle in front of the altar. Priests (or kannushi or shinshoku) dress in light-colored robes and wooden geta or elevated sandals, and during a service they wear tall tapered hats. A miko is a shrine maiden or priestess who performs the sacred Kagura dance. This is a great simplification. For one thing, a Buddhist temple complex frequently contains at least one Shintō shrine, and vice-versa. Shintō shrines frequently contain Buddhist iconography. The guardian statues may be Buddhist figures, and even the Shintō foxes may be represented as pronouncing a Buddhist mantra. Buddhist temples frequently have a rope and bell or rattle. Language can be a confusing maze when it comes to religion. Consider George Carlin's famous piece about how if God can make anything, and God can do anything, then could God make a rock so large that God can't lift it? No, because of language and logic. It has nothing at all to do with theology or belief. The term "God" (or Dieu or Бог or Θεός or יהוה or ﷲ or whatever language you choose) as that term is used in a Judeo-Christian-Islamic setting implies omnipotence, the ability to do anything. Once we agree on this meaning of the word "God", logic tells us that "A rock that God cannot lift" must be a contradiction, a thing that cannot exist, regardless of whether or not you believe in such a deity. You don't have to be a practicing Christian or Jew or Muslim to say that "unliftable rock" makes no sense in this context. So, is Shintō a religion? That depends on what you mean by the word "religion". The Japanese language didn't have a word for that concept until the mid 1800s. The rather academic book The Invention of Religion in Japan says that the Japanese term was devised then in order to talk to European visitors who wanted to discuss their model of practice and belief. Any of this leads to confusion and misunderstanding if you aren't very careful about what you mean by the words "religion", "God", "gods", and so on. Take the Hebrew word אלהים or Elohim. The Hebrew name of God, right? Yes, but... Elohim also was used in the Hebrew Bible to refer to groups of gods, such as the Canaanite pantheon. The Hebrew ending ים or -im indicates a plural masculine noun. The early Hebrews and Canaanites were henotheistic, recognizing many deities, worshiping more than one, but with primary worship dedicated to just one deity. For the Jewish people, that was Yahweh. Other regional deities were recognized and sometimes honored — El, Baal, Asherah, Dagon, and others. "No other gods before me" as the first of the Ten Commandments put it. The Jewish people may have become monolatrist under the leadership of Elijah in the 9th century BCE, but more likely a century later, under Hosea. That means that they believed that many gods exist, but they worship just one. See Psalm 82, in which Yahweh is in a divine council accusing the other deities of not helping people in need. They became truly monotheistic, believing that only one god exists, during the Babylonian exile. So, even something most of us think we generally understand, like "Judaism believes in just one god", isn't exactly the simple version we first think of. Joseph Campbell includes what he calls "an amusing story" in his book Oriental Mythology. It's certainly true, and maybe it actually happened. He says that the story made the rounds at the Ninth International Congress for the History of Religions in Tokyo in 1958. It was about two learned attendees, one a Western sociologist and the other a Shintō priest. And our friend the sociologist said to his friend the Shintō priest, "You know, I've now been to a number of these Shintō shrines and I've seen quite a few rites, and I've read about it, thought about it; but you know, I don't get the ideology. I don't get your theology." And that Japanese gentleman, polite, as though respecting the foreign scholar's profound question, paused for a while as though in thought. Then he looked, smiling, at his friend. "We do not have ideology," he said. "We do not have theology. We dance." Campbell goes on to explain that Shintō "is a religion not of sermons but of awe." Awe may or may not lead to words, but in either case it goes beyond words. Shintō doesn't claim to grasp the precise conception of spirit, but its sense of ubiquity. Shintō practice is not based on following a moral code. It is about living in awe and gratitude within the mystery of existence. It is about the sense of the numinous, that which can be discussed but can't be precisely defined. Such a place of worship is without images, simple in form, wonderfully roofed, and often painted a nice clear red. The priests, immaculate in white vesture, black headdresses, and large black wooden shoes, move about in files with stately mien. An eerie music rises, reedy, curiously spiritlike, punctuated by controlled heavy and light drumbeats and great gongs; threaded with the plucked, harplike sounds of a spirit-summoning koto. And then noble, imposing, heavily garbed dancers silently appear, either masked or unmasked, male or female. They move in slow, somewhat dreamlike or trancelike shamanizing measure; stay for a time before the eyes, and retire, while utterances are intoned. One is thown back two thousand years. The pines, rocks, forests, mountains, air, and sea of Japan awake and send out spirits on those sounds. They can be heard and felt all about. And when the dancers have retired and the music has stopped, the ritual is done. One turns and looks again at the rocks, the pines, the air and sea, and they are as silent as before. Only now they are inhabited, and one is aware anew of the wonder of the universe. Nevertheless, it seems to be difficult for people of a certain thinking type to experience what is evoked for them by such art. Shintō predates recorded history in Japan. It is a folk tradition of animism extending far back in time. Animism is the belief that anything can possess a spiritual essence — animals, plants, natural phenomena such as rivers and lakes and mountains, and even weather systems and human-made objects. Animism is the oldest belief system in the world, it describes the earliest "spiritual" or "supernatural" views of indigenous people. Animism dates from such early times that animistic indigenous people tend not to have a word for their belief or practice. Nor do they have a word for "religion". As the Japanese people say about Shintō practice, "that's what we do." This is much like how we don't really have a meaningful name for the planet where we live. "It's where we are. It's what we do." Animism includes the belief that all material phenomena have agency, that something makes things happen. It includes the belief that humans have a soul (or spirit, or some form of sentience or self-awareness), but also that so do other animals, and plants, rock formations, mountains, rivers, lakes, weather-like entities like winds and thunder and shadows, and even certain views of natural scenes, or views and soundscapes of waterfalls. Animism says that there is no sharp distinction between the spiritual world and the physical or material world. Shintō is usually translated into English as "the way of the gods", but this isn't "gods" as that term usually means in English. The Japanese term is kami, which would be less confusing as "spirits". Shintō recognizes the spirit or animating agency of a place or thing. The kami are nothing like the Buddhist idea of gods or deities, powerful supernatural beings beyond the Bodhisattvas or enlightened beings. Neither are they at all like the Abrahamic religions' Supreme Being. Given how wide-open animism is, it's not surprising that there has been a long debate over what it means and what all it includes. Is it an ancestral mode of experience common across indigenous people world-wide? Is it a complete religion on its own, a powerful way of interpreting the universe? Is it no more than a primitive but failed early attempt at spiritual understanding? Is it a judgmental classification applied by Victorian-era Englishmen intent on "civilizing the savages"? Is it a playground for modern-day neopagans, neoshamans, and people making it up as they go? Is its ambiguity used by atheists to question all religion? Yes. Yes to any or all of those. Edward Tylor's 1871 book Primitive Culture contained the first academic description and definition of animism. 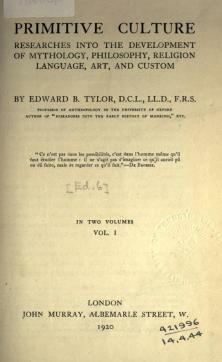 Tylor's book was part of the creation of the science of anthropology. By the end of the 19th century the anthropologists of that time had agreed on a model of "primitive society" with a religion based on animism, where animals (and possibly plants, fungi, etc) had souls or spirits. The beliefs and rituals of this animism had evolved over time into the "developed religions", which mostly meant Christianity as practiced at the time in northwestern Europe. According to Tylor, as a society became more scientifically advanced, fewer and fewer members would believe first in animism, and later in the more developed religions. Tylor's viewpoint was: "Religion is wrong. It is all the fault of animism, and we'll figure that out eventually." Other scientists then fell into the tar pit of animism arguments. Prominent developmental psychologist Jean Piaget suggested that children were born as animists, because they naturally anthropomorphize inanimate objects. Then Margaret Mead argued the opposite, that societies taught animism to otherwise innocent children. Many anthropologists dropped the term "animism" because of the unending arguments from extreme positions of both science and religion. You might as well have asked them about phrenology. The current practice of Shintō, and really the self-identity of Japan today, goes back to the early 8th century CE. That's when the Emperor commissioned the writing of two compilations of Imperial genealogical legends. Up to that time they were native lore passed along in oral form. The first of these was the Kojiki (or Records of Ancient Matters), written down in 711-712 CE, and the second was the Nihon Shoki (or Chronicles of Japan), written down about 720 CE. The word Shintō or "Way of the Kami" was adopted then to describe the spiritual folk tradition. A Chinese text of the 3rd century CE had reported that the Wa, the Japanese pronunciation of the Chinese term for Japan and its people, clapped their hands during worship. Shintō is also referred to as Kami-no-michi or the "way of the divine" or "way of the gods", Kannagara-no-michi or the "way of the divine transmitted from time immemorial", Kodo or the "ancient way", Daido or the "great way", and Teido or the "imperial way". Let's look at Joseph Campbell's comma-happy analysis in Oriental Mythology. Following a law that the reader will recognize, the Yamato rulers, in response to the Chinese inspiration, invented a past of their own, composed of local myths arranged as a world chronicle. However, in contrast to the dry-as-dust Confucians, who had considerably succeeded in de-mythologizing mythology without succeeding, however, in converting it into anything else, the freshly minted literati of Japan still had the dew of youth upon them. Their model was, indeed, a legendary Chinese chronicle of the sort first composed in Sumer, telling of the origin of the universe and ages of the gods, the ages, then, of superhuman kings, and the ages, finally, of heroic men approximately of our own length of years. But the material that they dressed to this frame was of their own, comparatively childlike, folkloristic heritage, and the result was the most remarkable history of the world-as-fairytale that the literature of our subject knows—which, in a way, befits Japan, where, as remarked in the first pages of my Primitive volume (chapter on "The Lesson of the Mask"), the extraordinary earnestness and profound gravity of the idea of life is masked by the fashionable fiction that everything is only play. Shintō scriptures are a mixture of history and myth. The following have all been used in forming Shintō practices and rituals. The earliest is the Kojiki (or Records of Ancient Matters), written down in 711-712 CE. The Empress Genmei asked that it be composed to sanctify the imperial court's claim to supremacy over rival clans. It is a collection of myths and legends, songs, genealogies, and semi-historical accounts recorded from oral tradition. The second oldest is Nihon Shoki (or Chronicles of Japan), written down about 720 CE in 30 volumes. It is more detailed than the Kojiki. It begins with the Japanese creation myth, the creation of the world and the first seven generations of divine beings, and following myths as in the Kojiki. The Kojiki stopped at 641 AD, while the Nihon Shoki continues up to about its time of writing. Fudoki (later called Ko-fudoki or "Old Fudoki") was compiled in 713-733 and collects provincial culture and oral tradition, with agricultural and historical records mixed with the mythology and folklore. The collection documents local myths and rituals not mentioned in the Kojiki or Nihon Shoki. At least 48 provinces contributed records. Shoku Nihongi is a 40-volume history covering a 95-year period from the beginning of Emperor Monmu's reign in 697 until the 10th year of Emperor Kanmu's reign in 791, including the reigns of nine Emperors. It was completed in 797. Kogo Shūi is a historical record of the Inbe clan of Japan. The Inbe and Nakatomi clans had both performed Shintō religious services for the Japanese imperial court for a long time. At the beginning of the Heian period of 794-1185, the Fujiwara clan, of whom the Nakatomi are a branch, seized political power and weakened the Inbe clan. The Kogo Shūi was written soon afterward to set the record straight and return power to the Inbe clan. It was presented to Emperor Heizei in 807. The creation myth and the first 40 legendary emperors are once again described. Kujiki or Sendai Kuji Hongi is a 10-volume history of ancient Japan up through Empress Suiko, the 33rd monarch. It was compiled between 807 and 936. Engishiki is a 50-volume collection about customs and laws, started in 905 and finished in 927. The first ten volumes are the Department of Worship, with liturgical texts, a list of all 2,861 Shintō shrines existing at the times, and a list of their enshrined kami or deities. 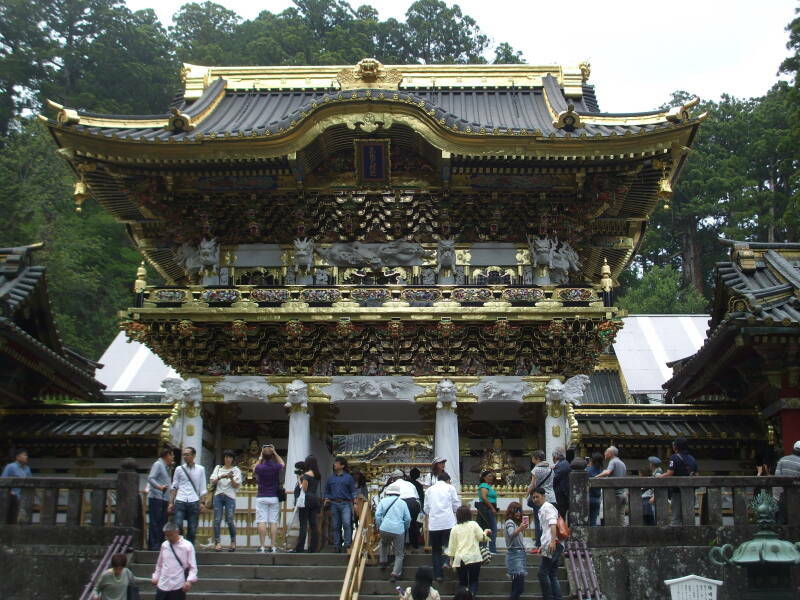 Now let's look at some examples of Shintō shrines.